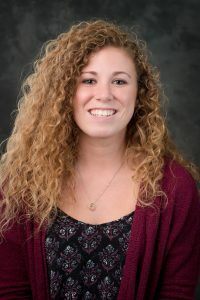 My name is Lindsay Winter, and I currently a first-year student at Central Michigan University’s Doctorate of Physical Therapy (PT) program. At Michigan Tech, my undergrad degree was in exercise science with a minor in psychology. I felt my undergrad education provided me with a well-rounded foundation to begin PT school. Between my exercise science and psychology courses, I feel I graduated from Michigan Tech with a firm background in physical, mental, and social health. Throughout my undergrad, a variety of experiences and resources helped prepare me for PT school. The courses that were included in my undergrad really emphasized the importance of having hands-on experience with the technology in our Kinesiology and Integrative Physiology (KIP) labs. I found it helpful that we were able to actually work with some of the equipment that would be used in physical therapy research and have an understanding of what the technology would be used for. Second, Michigan Tech has really made an effort to bring in speakers and create classes that are helpful for prospective physical therapy students. A KIP Seminar Series was created to bring researchers to campus and have them present on their current and past research projects. Also, I was able to take a PT Seminar class that was taught by a physical therapist that graduated from Michigan Tech! I found all of these to be very helpful in providing me with extra information related to physical therapy and made me more interested in the recent topics related to my field. Another important aspect of my success at Michigan Tech was the KIP department and Pre-Health staff. They were always so helpful throughout my time at Michigan Tech and in my PT school application process. Even though applying to PT school can be stressful, they always made sure our concerns were heard and made an extra effort to address any areas of the application we were struggling with. Central Michigan University has been a great fit for me so far. It’s obvious that all of the professors are passionate about their profession and want to see us become successful physical therapists in the future. They do a great job of challenging us to learn beyond what is taught in the classroom and make sure we are provided with the resources to do so. Finally, I really enjoy how the program stresses the importance of building relationships with our classmates and staff both in and out of the classroom. A tip that I would give to future students would be to do as much shadowing as possible. In addition, I would tell them to shadow in multiple different areas of physical therapy. The more experience you have coming into PT school, the better understanding you will have for how each area of physical therapy works. Many students are content with just shadowing outpatient clinics, but I would recommend that they try to gain experience in pediatrics, women’s health, inpatient care, neuro, etc. You never know where your passion may be! In my undergrad, I was on the women’s basketball team at Michigan Tech. Being involved in athletics and experiencing the injuries that go along with them is what drew me to become interested in physical therapy. Also, being apart of the team really allowed me to be extremely involved in the community. I was able to be a volunteer for numerous events throughout Houghton, which I found very enjoyable and a great learning opportunity. These events helped me realize that I wanted to work in a profession that allowed me to positively impact the lives of others and improve someone’s quality of life as well.